Mauritius is an attractive island in the Indian Ocean that welcomes foreign investors with an open economy, a favourable tax regime and a modern banking system. The island which covers an area of 1,865 square kilometres, is situated some 2,000 kilometres off the south east coast of Africa. More than 150 kilometres of white sandy beaches and transparent lagoon are protected from the open sea by the world’s third largest coral reef which almost surrounds the island. Being of volcanic origin, Mauritius has a central plateau which is about 400 metres above the sea level. Mountains scattered throughout the island, fast flowing rivers, tropical forests and plants are other features that add to the natural beauty of the island. Mauritius enjoys a maritime sub-tropical climate. The summer season lasts from October to May with temperatures averaging 27°C, while in the winter months temperature average 22°C. The topography of Mauritius makes the central plateau more humid and cooler that the other regions. The Dutch were the first settlers on the island in 1598 and named it after their ruler, Prince Maurice Van Nassau. It was under the French Governor, Mahé de Labourdonnais , that Mauritius experienced its first development: a harbour was built at Port Louis, which became the capital of Mauritius. Port Louis being the safest harbour for vessels on their way to India, prompted the British to occupy the island in 1810. Indentured labourers were brought in, mainly from India to work in the sugar cane fields. Mauritius achieved independence on the 12 March 1968 and adopted a constitution based on the British Parliament system. On the 12 march 1992 Mauritius became a Republic and it continues to form part of the British Commonwealth. The population of the Island is approximately 1,200,000 made up principally by people of European, African, Indian and Chinese origin. This has resulted in a unique blend of races, cultures and religions. Mauritius takes pride in the fact that these different cultures coexist in peace and succeed in creating a cultural entity that is distinctly Mauritian. The British ruled Mauritius for 158 years until 12 March 1968 when it became an independent country within the Commonwealth. The Republic of Mauritius is a Westminster style democracy. The President is the Head of State and Commander in Chief. Full executive power rests with the Prime Minister who is head of Government. The Members of Parliament are elected every five years by popular vote and a number of political parties contest the elections every five years, reflecting the country’s firm commitment to a multiparty political system. English is the official language. However, the Mauritian population is largely bilingual, being equally fluent in English and French. Creole is also spoken and understood by everyone. Common Law for corporate matters. Since independence in 1968, Mauritius has developed from a low income, agriculturally based economy to a middle-income diversified economy with growing industrial, financial, and tourism sectors. For most of the period, annual growth has been of the order of 5% to 6%. The government’s development strategy centres on foreign investment. 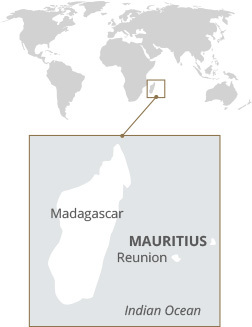 Mauritius has attracted more than 15,000 offshore entities, many aimed at commerce in India and South Africa, and investment in the banking sector alone has reached over $1 billion. The economy in 2000 grew by 8.9% and the Gross National Income per capita at market prices reached 101,948 rupees. Unemployment rate for 2000 is estimated at about 8.0% while inflation stood at 4.2%. The legal system of the Republic of Mauritius derives from both French and English sources. During the French rule (1715 until 1810) the Island’s system was governed by the French Napoleonic Code which remained in force under the British rule with subsequent amendments in civil and criminal procedural laws and company law. Mauritius, therefore, enjoys a hybrid legal system combining both the civil and common law practices. Though being a Republic, Mauritius still remains a member of the Commonwealth and the right of appeal to the Privy Council is preserved. The Republic of Mauritius, a presidential democracy modelled on the British system of parliamentary democracy, guarantees the separation of the legislative, executive and judicial powers. The President is the head of state and Commander-in-Chief, while the Prime Minister has full executive power and is the head of Government. The sixty-two members of the National Assembly are elected every five years by universal adult suffrage. All major political parties are represented, reflecting the depth of democracy prevailing in Mauritius. Parliament is the legislative authority in Mauritius. The population of the Island is approximately 1,300,000 made up principally by people of European, African, Indian and Chinese origin Mauritius takes pride in the fact that these different cultures co-exist in peace and succeed in creating a cultural entity that is distinctly Mauritian. The average working week is 9.00am to 5.30pm. However, many executives work longer hours. Mauritian business protocol and tradition demands punctuality when attending meetings. It is also best practice to arrange appointments several days in advance. Mauritius businesses deploy “Flat and Top down Hierarchical Structures” where the only divide is between managers and other ranks. Mauritius businessmen generally favour the establishment of pool working relationships with their subordinates. Business entertaining can be conducted during any meal and generally whoever initiates is expected to pay. It is customary to always shake hands. When being introduced or when meeting someone, as well as when leaving. Business cards are welcomed in business culture and are generally exchanged at the end of business meetings. Misplaced or exaggerated praise is not appreciated in Mauritius business culture. It is considered to be impolite and rude to maintain eye contact (unless a point is being emphasised), to stand too close when speaking or to talk loudly. Mauritius businessmen do respect personal space and therefore keeping an acceptable distance is recommended. It is considered rude to ask direct personal questions about occupation, income and background. Mauritius business dress code is generally conservative and the norm for both men and women is to wear smart, well tailored attire using darker colours. Many Mauritius companies have now introduced more “dressed down” attire but this generally relates to the high tech and core industries.